Spybot Search and Destroy – Say What? You know its Monday morning when your first attempt of getting online brings a suspicious pop up box warning you about spyware. Being apprehensive by nature and since partial paralysis of my right index finger had kicked in; I couldn’t click “ok” on anything. With slight movement restored, my first response was to call Jana. Now, while having your own in-house guru of computer troubleshooting is comforting, it can be a little frightening when you go on your first search and destroy mission of malware. Vivid flashbacks and a strong sense of self preservation prompted me to create a checklist of what to do should this happen again. So, after some back tracking and double checking each step with Jana, we thought it would be nice to share them with you. Should a suspicious pop up block appear – Do not click okay or agree to anything on the pop up box. Just close the box by clicking on the red x at the top right hand corner of the pop up box. For the novice internet user just copy and paste the link below into your URL (or address)bar http://download.cnet.com/Spybot-Search-amp-Destroy/3000-8022_4-10122137.html Click the Download Now button for the Spybot Search and Destroy (1.6.2). At the top of the screen a yellow bar will appear, and an Information box should appear on your screen. Click Close on the Information Bar box on the screen, and then click on the yellow bar at the top of the page. A box will appear, click Download File. When the File Download Security Warning box appears, click Run. You will see the software downloading. An Internet Explorer – Security Warning box will appear, click Run on it. From there the wizard will step you through setting it up. Once the software is loaded, you will need to check for updates. Once updated, click on Check for Problems. The spyware scan will take a while. If you have other projects you need to work on while the scan is running, simply minimize the scanning screen and finish your other projects. Once the scan is complete, any items that it finds can be deleted without harming your computer. As always, if you have problems or feel like you need a little help you can call our offices at 1.800.687.322 or 940.564.5659 Monday through Friday from 8:00 am to 5:00 pm. For free after hours tech support please call 1.800.687.7996. Spyware refers to software that is installed on your personal computer without your knowledge. It tracks personal or sensitive information, then sends the information to advertisers. This will increase pop-up advertisements (called adware). 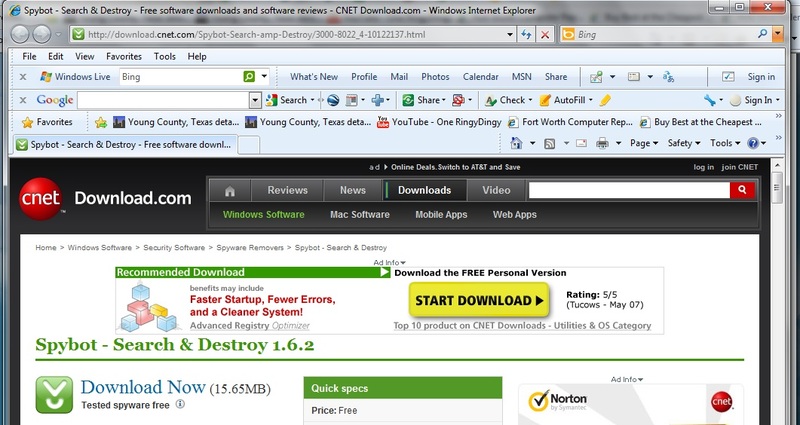 Many popular anti-virus software programs also contain anti-spyware software and give the ability to block spyware. Brazos recommends that its customers install reputable antivirus and anti-spyware software, update it regularly and use it regularly to run scans of their systems, and to regularly back-up their systems. Beware of pop-ups on your screen which warn you of possible problems and offer you a free scan and then sell you software to cure what may be a non-existent program. This is a common scam. IMPORTANT NOTICE – READ CAREFULLY! By clicking on any link on this page, you acknowledge and agree that the links will take you to third-party websites. Brazos does not control those websites and is not responsible for any information or software accessed through such link, or how confidential information or personally identifiable information is collected, protected and/or disclosed by the operators of those websites. Brazos does not support any software you purchase from such third parties. BRAZOS MAKES NO WARRANTY WHATSOEVER AS TO ANY SOFTWARE OR THIRD-PARTY INFORMATION AVAILABLE THROUGH A LINK APPEARING ON THIS WEBSITE AND EXPRESSLY DISCLAIMS ANY AND ALL WARRANTIES WITH REGARD TO SUCH SOFTWARE, INCLUDING ALL IMPLIED WARRANTIES AND CONDITIONS OF MERCHANTABILITY, FITNESS FOR A PARTICULAR PURPOSE, TITLE AND NON-INFRINGEMENT. You agree to look solely to the licensor of such software (and not to Brazos) as to any warranties backing such software. By clicking on any link on this website, you agree to indemnify, defend and hold harmless Brazos from and against any claims or damages, including but not limited to, any loss of data, computer repairs or corruption of your operating system, resulting from your use of software or information obtained from any such link.